Wayne still applied. Thirty-two years later, both he and Donna continue to find their work at Gould Farm amazingly life-affirming. 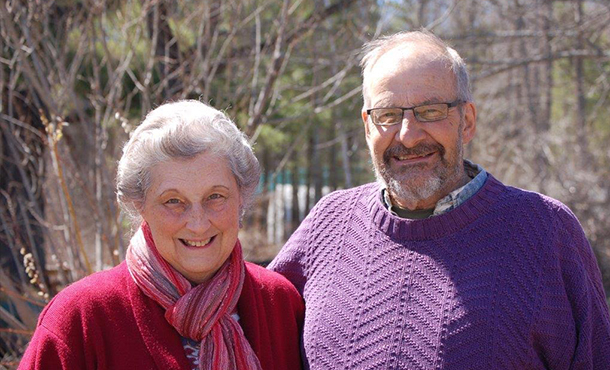 The Burkharts are the recipients of the 2016 Distinguished Service Award from Eastern Mennonite University. Nestled in Massachusetts’ scenic Berkshire hills, the 650-acre farm offered the couple not only jobs—Donna also joined the staff— but a vibrant community and callings as well. Gould Farm’s mission is to offer open hearts and doors to individuals “suffering in mind and spirit,” according to its 1913 charter written by Will and Agnes Gould. More than a century later, the residential therapeutic community remains on the cutting edge of psychiatric practice. On any given day, some 40 guests reside at Gould Farm. Many have passed through an acute phase, often the onset, of severe depression, bipolar disorder, schizoaffective disorder, or schizophrenia. Stabilized with medication, they are ready to learn to manage their psychiatric disorder, but are also dealing with loss of self-worth and a firm sense of their place in the world. The Burkharts are among approximately 50 staff members and their families who form the core of the ongoing community. Donna is director of client services, while Wayne is agricultural director. Staff includes both trained professionals and volunteers from around the world. Therapy occurs in life’s daily events, Donna says, as people listen to one another while they pick greens to make a salad, bottle-feed a new calf, milk cows, tap sugar maples, or clean up after dinner. (Even the director washes dishes.) Guests participate in one of several work teams that care for animals, gardens, buildings and grounds. They also prepare farm-to-table meals and make cheese, yogurt, and baked goods that are enjoyed in the dining room or shared with neighbors at the Roadside Café or the Harvest Barn Bakery. “When you’re working alongside someone who can hardly talk, and they’re now coming back into fellowship with life, that’s very satisfying,” says Wayne. Both grew up in Mennonite communities, Wayne on a northern Michigan farm, and Donna in Delaware. They met at EMC, English majors, and then worked for four years with Mennonite Central Committee in the Democratic Republic of the Congo. When the Burkharts joined the Gould Farm community, they had no reason to believe mental illness would personally strike them. The oldest of their two sons, then 10, asked his parents whether he would get schizophrenia. They told him the possibility was low; it affects 1 percent of the population. The couples’ compassion for people coping with mental illness grew even deeper. As admissions director, Donna daily speaks with families coming to terms with a diagnosis. “I have incredible reserves of understanding for what the families are going through. It’s not just one member experiencing the illness. It affects them all,” she says. What a blessing! For those of us who have been affected by mental illness in our families, knowing there is a safe place for them and others who have experienced our pain is a relief. Thank you for all that you do. We are so grateful to everyone at Gould Farm for creating such a loving healing place where our son is in recovery. We were so desperate to find help and you opened your hearts to give him a path to a future we prayed for. You saved his life, and ours. As our son slowly makes progress, I am grateful everyday for the Burkharts and Gould Farm. A place where he feels safe and a sense of community, not loneliness. A place where the work he does gives him a sense of worth and fulfillment. When my husband, also a Mennonite, learned Donna was as well…he felt it was a sign from God. Congratulations to Donna and Wayne. Wayne and Donna, I was deeply touched by the work you are doing, and yoiur painful life experience. As a psychiatrist, I saw these issues first hand, and applaud the work you are doing!